REMINDER RE INJURIES – REPORT THEM! ALL injuries need to be entered onto the online injury management system as a matter of urgency and if the BHA Medical Department are not made aware of these injuries, they will not hold accurate records. If a jockey then decides to return to race riding without checking with the BHA, there could be serious consequences if that jockey is not fully fit and in addition it will INVALIDATE your insurance! REMEMBER: ALL injuries must be reported to the Medical Department at the BHA. This includes injuries sustained whilst race riding abroad. Any queries, contact the AJA or the BHA Medical Department. Champion Jockey Serena Brotherton leads the field out to the paddock at Catterick Bridge with Catherine Walton (middle) literally emerging out of her shadow and Becky Smith (right). Coincidentally, these 3 jockeys finished in the first three, Catherine denying Becky her first flat win with Serena third. 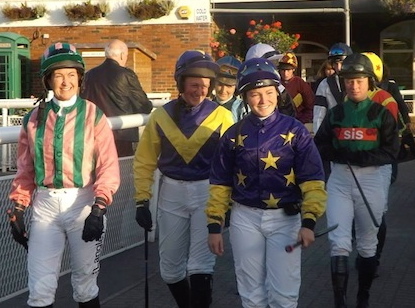 With reigning champion lady jockey Serena Brotherton stealing a march on the ladies championship and until recently leading with 4 wins, last week’s surprise win by Catherine Walton at Nottingham was her 3rd win of the season and she was able to follow up with another today at Catterick Bridge. The two girls now lead the ladies with only 3 races left! (18th: Ladies @ Redcar; 25th: Mixed @ Doncaster; 26th Ladies finale @ Newbury). Good luck girls! Meanwhile the gentlemen’s tables are led by reigning champion Simon Walker along with Jamie Hamilton on 3 winners each. As well as the mixed race at Doncaster, 4 gentlemen’s races remain: 13th @ Goodwood, 21st @ Windsor, 28th @ Leicester and the finale @ Nottingham on 6th November. This Fegentri season has seen mixed fortunes for our two GB representatives with Emma Sayer sustaining broken vertebrae when falling in a chase in Dieppe on 2nd June. Very disappointingly, this knocked her out of the 2013 Fegentri Series as the doctor stood her down until mid-October but the good news is that Emma has healed well and will soon be back in the saddle. We all look forward to seeing her back in action on the racecourse again soon. Our gentleman representative, Freddie Mitchell, has managed to stay injury free but has also had his own share of bad luck, having won the Marechal Foch in Auteuil on 19th May. Following the race, with no Stewards’ Enquiry called, the French lady rider Barbara Guenet who finished 3rd (on the near side of the track) objected to Freddie (on the far side of the track) and following the subsequent enquiry (all in French so that Freddie was unable to defend himself) Freddie was demoted to 3rd place. Barbara, Assistant to Guillaume Macaire, has gone on to win the Fegentri Jump Championship. Meanwhile Freddie’s rides on the Flat have been less eventful and he is currently in pole position on 144 points (from Alexandre Lemarie of France on 103 points) having finished 2nd to Fabrizio Perego of Italy in Maienfeld, Switzerland today. (Chris Martin also got a last minute spare ride!) Details of the men’s finale is yet to be confirmed but Nottingham host their next race on 30th October. Good luck Freddie! Applications are invited for next year’s Cheltenham Festival charity race which takes place as the last of the day on St Patrick’s Thursday 13th March. This race has grown into one of the principal fundraisers for Cancer Research UK and it is hoped that the 2014 running will take the total amount raised to over £1 million since its inaugural running in 2009. 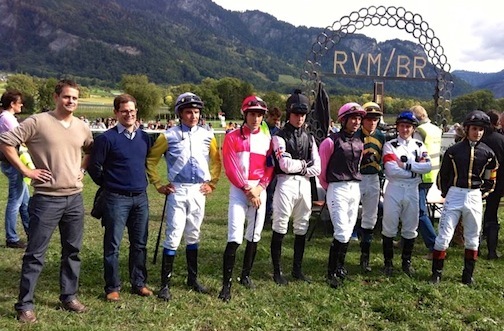 With a maximum field of 12 runners, the race over a mile and five furlongs is open to any competent rider (other than a professional jockey) who feels they can raise the required amount of at least £5,000 in sponsorship and provide their own horse.